AT SEA - JULY 14: HMS Ark Royal patrols the sea during Exercise Auriga on July 14, 2010 at sea in Omslow Bay near North Carolina. 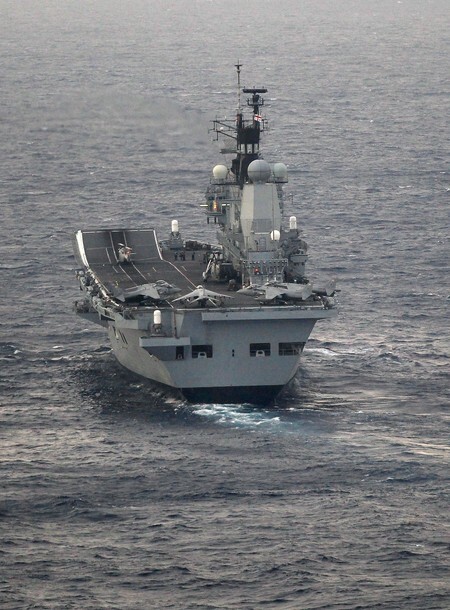 HMS Ark Royal, the nation's strike carrier, is leading an international task group during exercise Auriga 2010 a joint US-British amphibious exercise in Onslow Bay, off the cost of North Carolina. 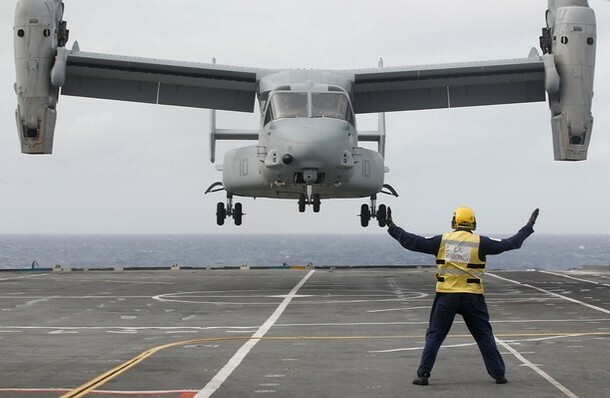 Auriga 2010 will demonstrate the UK's ability to deploy, operate and sustain a task group out of area for a prolonged period. 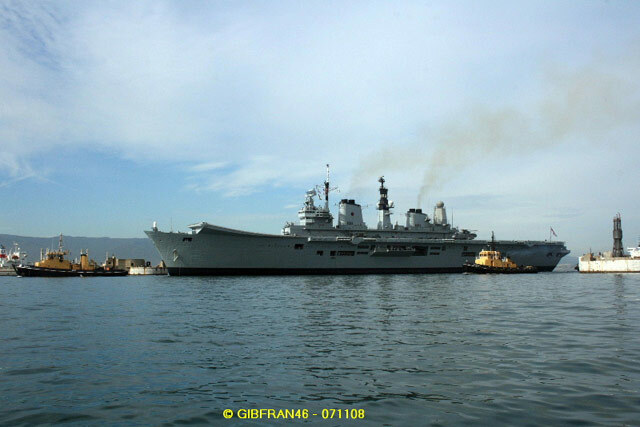 At full strength the Ark Royal has a full crew of 1100 to 1200. At 210 metres in length and weighing 20,000 tonnes she is the fifth vessel in the history of Britain's Royal Navy to carry the historic name of Ark Royal and is currently celebrating 25 years at sea. 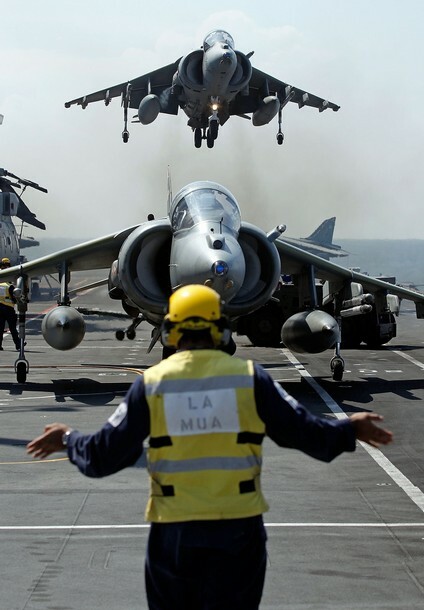 AT SEA - JULY 14: A Harrier jet of 1(F) Joint Force Squadron hovers as it comes in to land on the flight deck of HMS Ark Royal during Exercise Auriga on July 14, 2010 at sea in Onslow Bay near North Carolina. 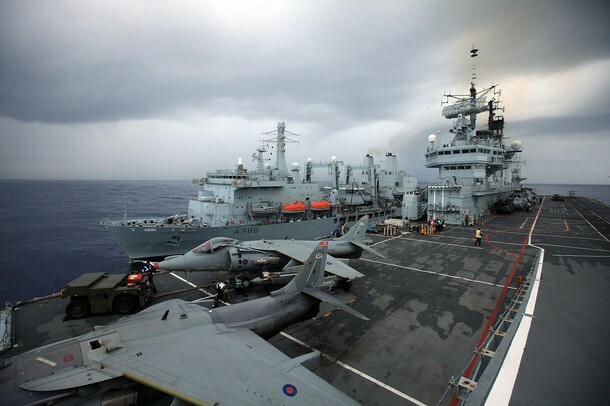 HMS Ark Royal, the nation's strike carrier, is leading an international task group during exercise Auriga 2010 a joint US-British amphibious exercise in Onslow Bay, off the cost of North Carolina. Auriga 2010 will demonstrate the UK's ability to deploy, operate and sustain a task group out of area for a prolonged period. At full strength the Ark Royal has a full crew of 1100 to 1200. 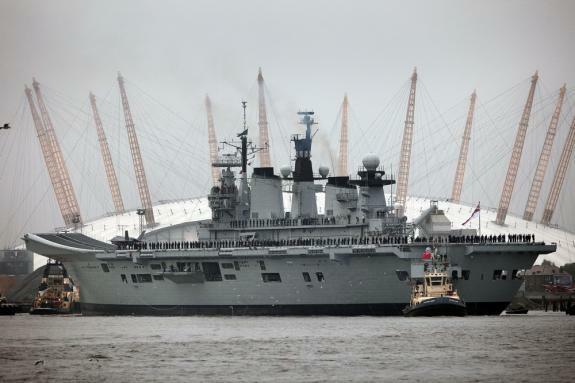 At 210 metres in length and weighing 20,000 tonnes she is the fifth vessel in the history of Britain's Royal Navy to carry the historic name of Ark Royal and is currently celebrating 25 years at sea. 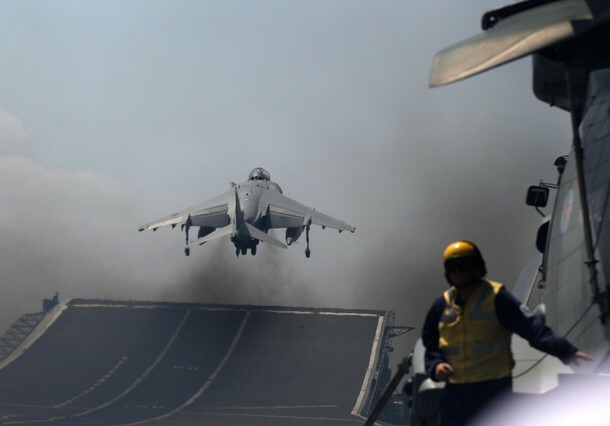 AT SEA - JULY 14: A Harrier jet of 1(F) Joint Force Squadron takes off from the flight deck of HMS Ark Royal during Exercise Auriga on July 14, 2010 at sea in Onslow Bay near North Carolina. HMS Ark Royal, the nation's strike carrier, is leading an international task group during exercise Auriga 2010 a joint US-British amphibious exercise in Onslow Bay, off the cost of North Carolina. Auriga 2010 will demonstrate the UK's ability to deploy, operate and sustain a task group out of area for a prolonged period. At full strength the Ark Royal has a full crew of 1100 to 1200. 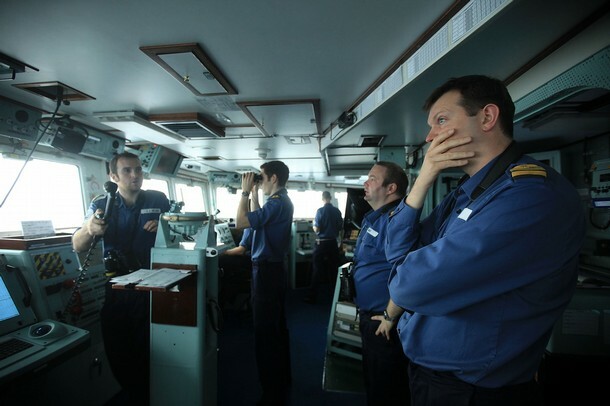 At 210 metres in length and weighing 20,000 tonnes she is the fifth vessel in the history of Britain's Royal Navy to carry the historic name of Ark Royal and is currently celebrating 25 years at sea..
AT SEA - JULY 14: Sailors on the bridge of HMS Ark Royal make visual checks during a storm during Exercise Auriga on July 14, 2010 at sea in Onslow Bay near North Carolina. HMS Ark Royal, the nation's strike carrier, is leading an international task group during exercise Auriga 2010 a joint US-British amphibious exercise in Onslow Bay, off the cost of North Carolina. Auriga 2010 will demonstrate the UK's ability to deploy, operate and sustain a task group out of area for a prolonged period. At full strength the Ark Royal has a full crew of 1100 to 1200. 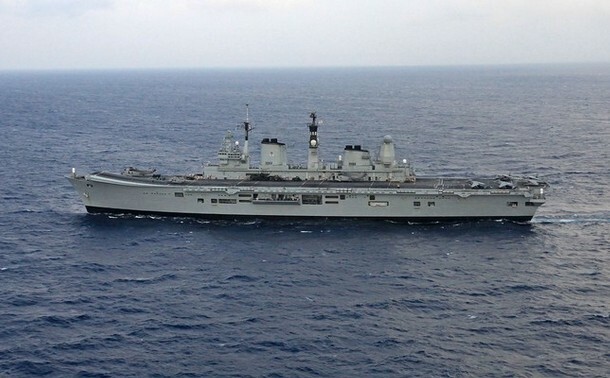 At 210 metres in length and weighing 20,000 tonnes she is the fifth vessel in the history of Britain's Royal Navy to carry the historic name of Ark Royal and is currently celebrating 25 years at sea. 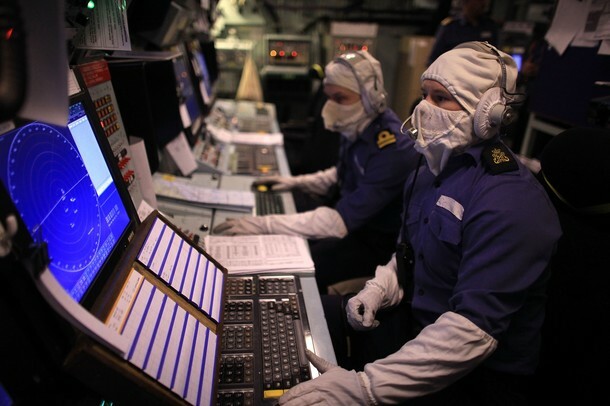 AT SEA - JULY 14: Sailors don their anti-flash protection as they work in the operations room of HMS Ark Royal during Exercise Auriga on July 14, 2010 at sea in Onslow Bay near North Carolina. 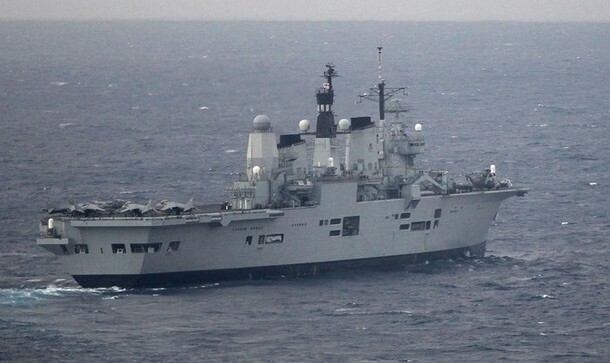 HMS Ark Royal, the nation's strike carrier, is leading an international task group during exercise Auriga 2010 a joint US-British amphibious exercise in Onslow Bay, off the cost of North Carolina. Auriga 2010 will demonstrate the UK's ability to deploy, operate and sustain a task group out of area for a prolonged period. At full strength the Ark Royal has a full crew of 1100 to 1200. At 210 metres in length and weighing 20,000 tonnes she is the fifth vessel in the history of Britain's Royal Navy to carry the historic name of Ark Royal and is currently celebrating 25 years at sea. 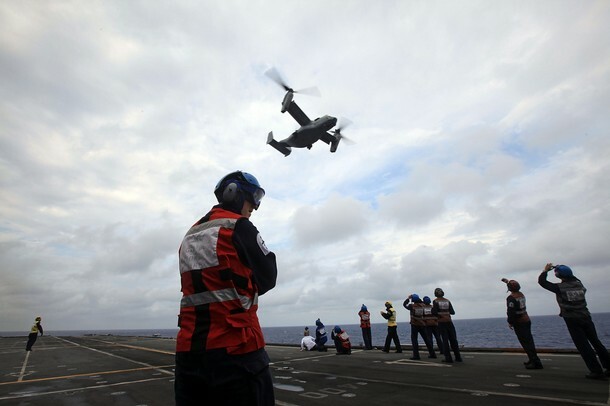 AT SEA - JULY 14: A US Marine Corp V-22 Osprey lands on board HMS Ark Royal for the first time during Exercise Auriga on July 14, 2010 at sea in Onslow Bay near North Carolina. HMS Ark Royal, the nation's strike carrier, is leading an international task group during exercise Auriga 2010 a joint US-British amphibious exercise in Onslow Bay, off the cost of North Carolina. Auriga 2010 will demonstrate the UK's ability to deploy, operate and sustain a task group out of area for a prolonged period. At full strength the Ark Royal has a full crew of 1100 to 1200. 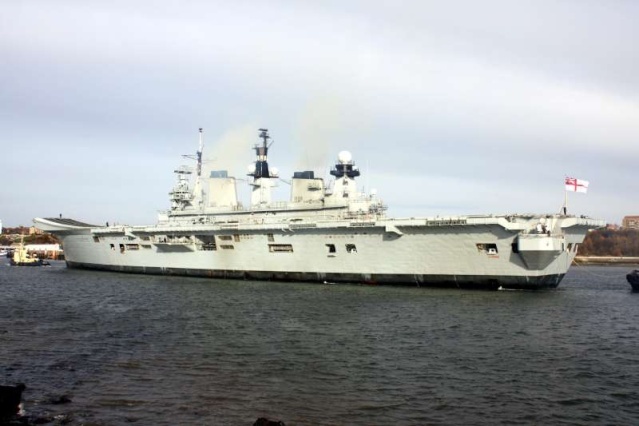 At 210 metres in length and weighing 20,000 tonnes she is the fifth vessel in the history of Britain's Royal Navy to carry the historic name of Ark Royal and is currently celebrating 25 years at sea. 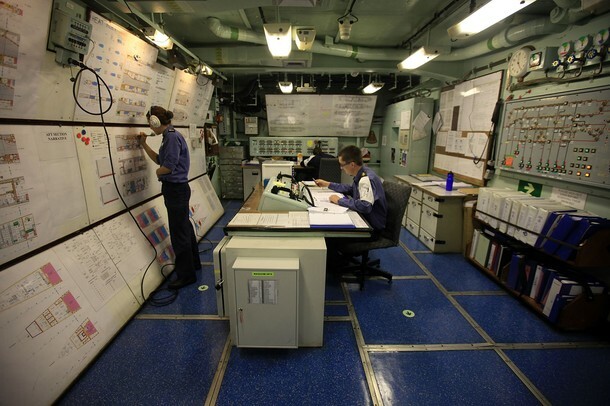 AT SEA - JULY 14: Sailor Harriet Fowles works in the command room of HMS Ark Roya lduring Exercise Auriga on July 14, 2010 at sea in Onslow Bay near North Carolina. HMS Ark Royal, the nation's strike carrier, is leading an international task group during exercise Auriga 2010 a joint US-British amphibious exercise in Onslow Bay, off the cost of North Carolina. Auriga 2010 will demonstrate the UK's ability to deploy, operate and sustain a task group out of area for a prolonged period. At full strength the Ark Royal has a full crew of 1100 to 1200. 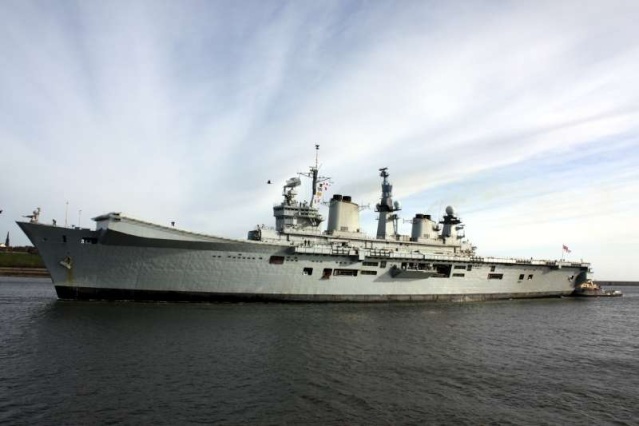 At 210 metres in length and weighing 20,000 tonnes she is the fifth vessel in the history of Britain's Royal Navy to carry the historic name of Ark Royal and is currently celebrating 25 years at sea. 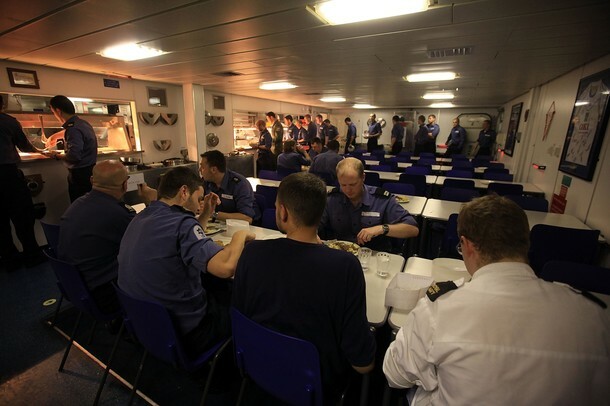 AT SEA - JULY 14: Sailors take their meals in the galley of HMS Ark Royal during Exercise Auriga on July 14, 2010 at sea in Onslow Bay near North Carolina. 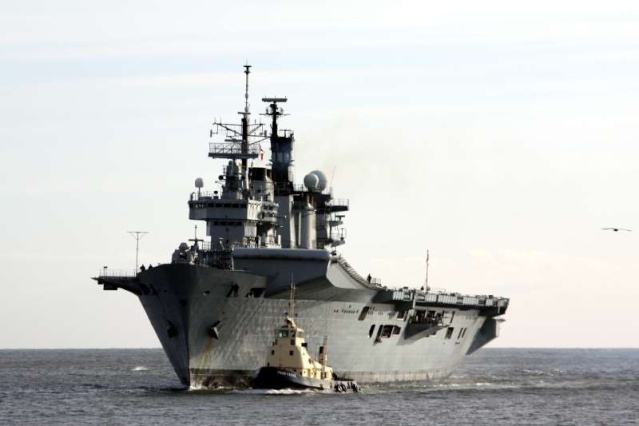 HMS Ark Royal, the nation's strike carrier, is leading an international task group during exercise Auriga 2010 a joint US-British amphibious exercise in Onslow Bay, off the cost of North Carolina. Auriga 2010 will demonstrate the UK's ability to deploy, operate and sustain a task group out of area for a prolonged period. At full strength the Ark Royal has a full crew of 1100 to 1200. At 210 metres in length and weighing 20,000 tonnes she is the fifth vessel in the history of Britain's Royal Navy to carry the historic name of Ark Royal and is currently celebrating 25 years at sea. 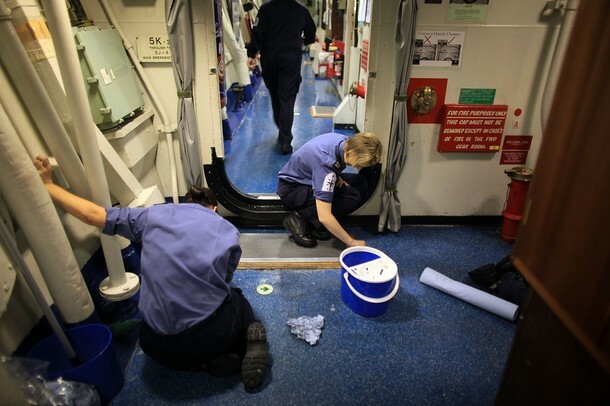 AT SEA - JULY 14: Female sailors keep the decks ship shape on HMS Ark Royal during Exercise Auriga on July 14, 2010 at sea in Onslow Bay near North Carolina. 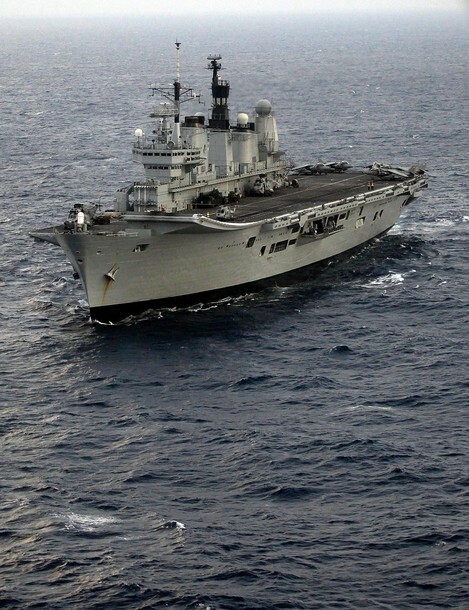 HMS Ark Royal, the nation's strike carrier, is leading an international task group during exercise Auriga 2010 a joint US-British amphibious exercise in Onslow Bay, off the cost of North Carolina. Auriga 2010 will demonstrate the UK's ability to deploy, operate and sustain a task group out of area for a prolonged period. At full strength the Ark Royal has a full crew of 1100 to 1200. At 210 metres in length and weighing 20,000 tonnes she is the fifth vessel in the history of Britain's Royal Navy to carry the historic name of Ark Royal and is currently celebrating 25 years at sea. AT SEA - JULY 14: RFA Fort George comes alongside HMS Ark Royal to replenish the ship at sea during Exercise Auriga on July 14, 2010 at sea in Onslow Bay near North Carolina. 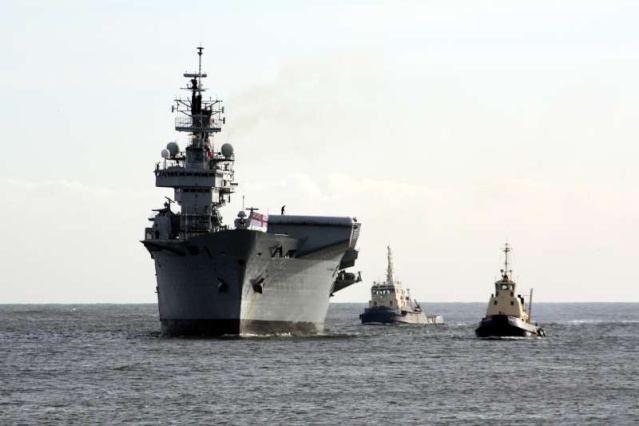 HMS Ark Royal, the nation's strike carrier, is leading an international task group during exercise Auriga 2010 a joint US-British amphibious exercise in Onslow Bay, off the cost of North Carolina. 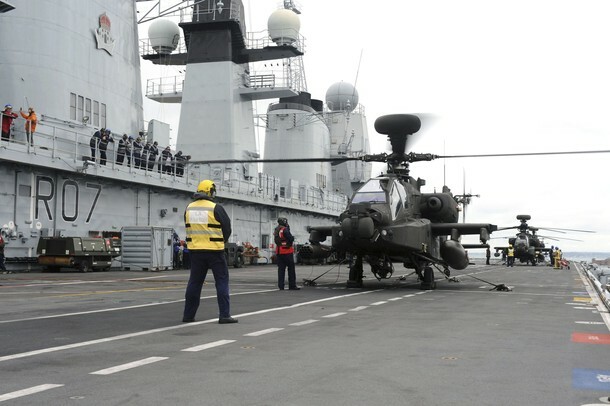 Auriga 2010 will demonstrate the UK's ability to deploy, operate and sustain a task group out of area for a prolonged period. At full strength the Ark Royal has a full crew of 1100 to 1200. 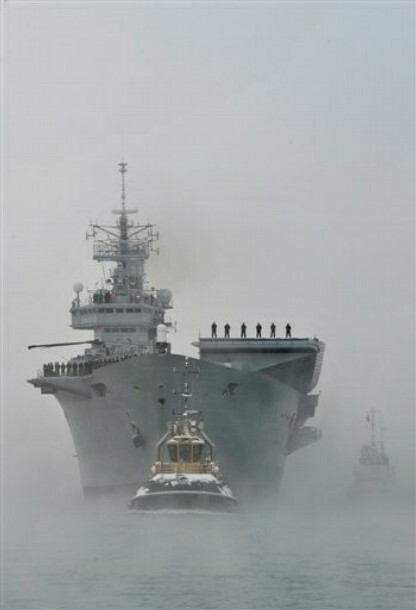 At 210 metres in length and weighing 20,000 tonnes she is the fifth vessel in the history of Britain's Royal Navy to carry the historic name of Ark Royal and is currently celebrating 25 years at sea.